Cover illustration of Harper's Weekly December 13, 1913 by James Montgomery Flagg. "The great monopoly in this country is the money monopoly. So long as that exists, our old variety and freedom and individual energy of development are out of the question. A great industrial nation is controlled by its system of credit. Our system of credit is concentrated. The growth of the nation, therefore, and all our activities are in the hands of a few men, who, even if their actions be honest and intended for the public interest, are necessarily concentrated upon the great undertakings in which their own money is involved and who, necessarily, by every reason of their own limitations, chill and check and destroy genuine economic freedom. This is the greatest question of all; and to this, statesmen must address themselves with an earnest determination to serve the long future and the true liberties of men." "It is impossible that there should be competition with all the facilities for raising money or selling large issues of bonds in the hands of these few bankers and their partners and allies, who together dominate the financial policies of most of the existing systems. . . . The acts of this inner group, as here described, have nevertheless been more destructive of competition than anything accomplished by the trusts, for they strike at the very vitals of potential competition in every industry that is under their protection, a condition which if permitted to continue, will render impossible all attempts to restore normal competitive conditions in the industrial world. . . .
"If the arteries of credit now clogged well-nigh to choking by the obstructions created through the control of these groups are opened so that they may be permitted freely to play their important part in the financial system, competition in large enterprises will become possible and business can be conducted on its merits instead of being subject to the tribute and the good will of this handful of self-constituted trustees of the national prosperity." The promise of New Freedom was joyously proclaimed in 1913. The facts which the Pujo Investigating Committee and its able Counsel, Mr. Samuel Untermyer, have laid before the country, show clearly the means by which a few men control the business of America. The report proposes measures which promise some relief. Additional remedies will be proposed. Congress will soon be called upon to act. How shall the emancipation be wrought? On what lines shall we proceed? The facts, when fully understood, will teach us. First: There is the obvious consolidation of banks and trust companies; the less obvious affiliations--through stockholdings, voting trusts and interlocking directorates--of banking institutions which are not legally connected; and the joint transactions, gentlemen's agreements, and "banking ethics" which eliminate competition among the investment bankers. Second: There is the consolidation of railroads into huge systems, the large combinations of public service corporations and the formation of industrial trusts, which, by making businesses so "big" that local, independent banking concerns cannot alone supply the necessary funds, has created dependence upon the associated New York bankers. But combination, however intensive, along these lines only, could not have produced the Money Trust--another and more potent factor of combination was added. The development of our financial oligarchy followed, in this respect, lines with which the history of political despotism has familiarized us:-usurpation, proceeding by gradual encroachment rather than by violent acts; subtle and often long-concealed concentration of distinct functions, which are beneficent when separately administered, and dangerous only when combined in the same persons. It was by processes such as these that Caesar Augustus became master of Rome. The makers of our own Constitution had in mind like dangers to our political liberty when they provided so carefully for the separation of governmental powers. The original function of the investment banker was that of dealer in bonds, stocks and notes; buying mainly at wholesale from corporations, municipalities, states and governments which need money, and selling to those seeking investments. The banker performs, in this respect, the function of a merchant; and the function is a very useful one. Large business enterprises are conducted generally by corporations. The permanent capital of corporations is represented by bonds and stocks. The bonds and stocks of the more important corporations are owned, in large part, by small investors, who do not participate in the management of the company. Corporations require the aid of a banker-middleman, for they lack generally the reputation and clientele essential to selling their own bonds and stocks direct to the investor. Investors in corporate securities, also, require the services of a banker-middleman. The number of securities upon the market is very large. Only a part of these securities is listed on the New York Stock Exchange; but its listings alone comprise about sixteen hundred different issues aggregating about $26,500,000,000, and each year new listings are made averaging about two hundred and thirty-three to an amount of $1,500,000,000. For a small investor to make an intelligent selection from these many corporate securities--indeed, to pass an intelligent judgment upon a single one--is ordinarily impossible. He lacks the ability, the facilities, the training and the time essential to a proper investigation. Unless his purchase is to be little better than a gamble, he needs the advice of an expert, who, combining special knowledge with judgment, has the facilities and incentive to make a thorough investigation. This dependence, both of corporations and of investors, upon the banker has grown in recent years, since women and others who do not participate in the management, have become the owners of so large a part of the stocks and bonds of our great corporations. Over half of the stockholders of the American Sugar Refining Company and nearly half of the stockholders of the Pennsylvania Railroad and of the New York, New Haven & Hartford Railroad are women. Good-will--the possession by a dealer of numerous and valuable regular customers--is always an important element in merchandising. But in the business of selling bonds and stocks, it is of exceptional value, for the very reason that the small investor relies so largely upon the banker's judgment. This confidential relation of the banker to customers--and the knowledge of the customers' private affairs acquired incidentally--is often a determining factor in the marketing of securities. With the advent of Big Business such good-will possessed by the older banking houses, preeminently J. P. Morgan & Co. and their Philadelphia House called Drexel & Co., by Lee, Higginson & Co. and Kidder, Peabody, & Co. of Boston, and by Kuhn, Loeb & Co. of New York, became of enhanced importance. The volume of new security issues was greatly increased by huge railroad consolidations, the development of the holding companies, and particularly by the formation of industrial trusts. The rapidly accumulating savings of our people sought investment. The field of operations for the dealer in securities was thus much enlarged. And, as the securities were new and untried, the services of the investment banker were in great demand, and his powers and profits increased accordingly. But this enlargement of their legitimate field of operations did not satisfy investment bankers. They were not content merely to deal in securities. They desired to manufacture them also. They became promoters, or allied themselves with promoters. Thus it was that J. P. Morgan & Company formed the Steel Trust, the Harvester Trust and the Shipping Trust. And, adding the duties of undertaker to those of midwife, the investment bankers became, in times of corporate disaster, members of security-holders' "Protective Committees"; then they participated as "Reorganization Managers" in the reincarnation of the unsuccessful corporations and ultimately became directors. It was in this way that the Morgan associates acquired their hold upon the Southern Railway, the Northern Pacific, the Reading, the Erie, the Père Marquette, the Chicago and Great Western, and the Cincinnati, Hamilton & Dayton. Often they insured the continuance of such control by the device of the voting trust; but even where no voting trust was created, a secure hold was acquired upon reorganization. It was in this way also that Kuhn, Loeb & Co. became potent in the Union Pacific and in the Baltimore & Ohio. But the banker's participation in the management of corporations was not limited to cases of promotion or reorganization. An urgent or extensive need of new money was considered a sufficient reason for the banker's entering a board of directors. Often without even such excuse the investment banker has secured a place upon the Board of Directors, through his powerful influence or the control of his customers' proxies. Such seems to have been the fatal entrance of Mr. Morgan into the management of the then prosperous New York, New Haven & Hartford Railroad, in 1892. When once a banker has entered the Board--whatever may have been the occasion--his grip proves tenacious and his influence usually supreme; for he controls the supply of new money. The investment banker is naturally on the lookout for good bargains in bonds and stocks. Like other merchants he wants to buy his merchandise cheap. But when he becomes director of a corporation, he occupies a position which prevents the transaction by which he acquires its corporate securities from being properly called a bargain. Can there be real bargaining where the same man is on both sides of a trade? The investment banker, through his controlling influence on the Board of Directors, decides that the corporation shall issue and sell the securities, decides the price at which it shall sell them, and decides that it shall sell the securities to himself. The fact that there are other directors besides the banker on the Board does not, in practice, prevent this being the result. The banker, who holds the purse-strings, becomes usually the dominant spirit. 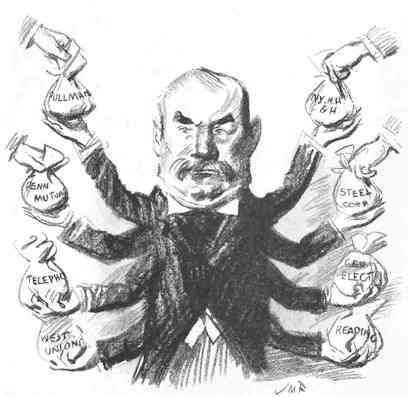 Through voting-trusteeships, exclusive financial agencies, membership on executive or finance committees, or by mere directorships, J. P. Morgan & Co., and their associates, held such financial power in at least thirty-two transportation systems, public utility corporations and industrial companies--companies with an aggregate capitalization of $17,273,000,000. Mainly for corporations so controlled, J. P. Morgan & Co. procured the public marketing in ten years of security issues aggregating $1,950,000,000. This huge sum does not include any issues marketed privately, nor any issues, however marketed, of intra-state corporations. Kuhn, Loeb & Co. and a few other investment bankers exercise similar control over many other corporations. Such control of railroads, public service and industrial corporations assures to the investment bankers an ample supply of securities at attractive prices; and merchandise well bought is half sold. But these bond and stock merchants are not disposed to take even a slight risk as to their ability to market their goods. They saw that if they could control the security buyers, as well as the security-makers, investment banking would, indeed, be "a happy hunting ground"; and they have made it so. The numerous small investors cannot, in the strict sense, be controlled; but their dependence upon the banker insures their being duly influenced. A large part, however, of all bonds issued and of many stocks are bought by the prominent corporate investors; and most prominent among these are the life insurance companies, the trust companies, and the banks. The purchase of a security by these institutions not only relieves the banker of the merchandise, but recommends it strongly to the small investor, who believes that these institutions are wisely managed. These controlled corporate investors are not only large customers, but may be particularly accommodating ones. Individual investors are moody. They buy only when they want to do so. They are sometimes inconveniently reluctant. Corporate investors, if controlled, may be made to buy when the bankers need a market. It was natural that the investment bankers proceeded to get control of the great life insurance companies, as well as of the trust companies and the banks. The field thus occupied is uncommonly rich. The life insurance companies are our leading institutions for savings. Their huge surplus and reserves, augmented daily, are always clamoring for investment. No panic or money shortage stops the inflow of new money from the perennial stream of premiums on existing policies and interest on existing investments. The three great companies-the New York Life, the Mutual of New York, and the Equitable-would have over $55,000,000 of new money to invest annually, even if they did not issue a single new policy. In 1904--just before the Armstrong investigation--these three companies had together $1,247,331,738.18 of assets. They had issued in that year $1,025,671,126 of new policies. The New York legislature placed in 1906 certain restrictions upon their growth; so that their new business since has averaged $547,384,212, or only fifty-three per cent. of what it was in 1904. But the aggregate assets of these companies increased in the last eight years to $1,817,052,260.36. At the time of the Armstrong investigation the average age of these three companies was fifty-six years. The growth of assets in the last eight years was about half as large as the total growth in the preceding fifty-six years. These three companies must invest annually about $70,000,000 of new money; and besides, many old investments expire or are changed and the proceeds must be reinvested. A large part of all life insurance surplus and reserves are invested in bonds. The aggregate bond investments of these three companies on January 1, 1913, was $1,019,153,268.93. It was natural that the investment bankers should seek to control these never-failing reservoirs of capital. George W. Perkins was Vice-President of the New York Life, the largest of the companies. While remaining such he was made a partner in J. P. Morgan Co., and in the four years preceding the Armstrong investigation, his firm sold the New York Life $38,804,918.51 in securities. The New York Life is a mutual company, supposed to be controlled by its policy holders. But as the Pujo Committee finds "the so-called control of life insurance companies by policy-holders through mutualization is a farce" and "its only result is to keep in office a self-constituted, self-perpetuating management." The Equitable Life Assurance Society is a stock company and is controlled by $100,000 of stock. The dividend on this stock is limited by law to seven per cent. ; but in 1910 Mr. Morgan paid about $3,000,000 for $51,000, par value of this stock, or $5,882.35 a share. The dividend return on the stock investment is less than one-eighth of one per cent. ; but the assets controlled amount now to over $500,000,000. And certain of these assets had an especial value for investment bankers;-namely, the large holdings of stock in banks and trust companies. The Armstrong investigation disclosed the extent of financial power exerted through the insurance company holdings of bank and trust company stock. The Committee recommended legislation compelling the insurance companies to dispose of the stock within five years. A law to that effect was enacted, but the time was later extended. The companies then disposed of a part of their bank and trust company stocks; but, as the insurance companies were controlled by the investment bankers, these gentlemen sold the bank and trust company stocks to themselves. "Here, then, were stocks of five important trust companies and one of our largest national banks in New York City that had been held by these two life insurance companies. Within five years all of these stocks, so far as distributed by the insurance companies, have found their way into the hands of the men who virtually controlled or were identified with the management of the insurance companies or of their close allies and associates, to that extent thus further entrenching them." The banks and trust companies are depositaries, in the main, not of the people's savings, but of the business man's quick capital. Yet, since the investment banker acquired control of banks and trust companies, these institutions also have become, like the life companies, large purchasers of bonds and stocks. Many of our national banks have invested in this manner a large part of all their resources, including capital, surplus and deposits. The bond investments of some banks exceed by far the aggregate of their capital and surplus, and nearly equal their loanable deposits. The goose that lays golden eggs has been considered a most valuable possession. But even more profitable is the privilege of taking the golden eggs laid by somebody else's goose. The investment bankers and their associates now enjoy that privilege. They control the people through the people's own money. If the bankers' power were commensurate only with their wealth, they would have relatively little influence on American business. Vast fortunes like those of the Astors are no doubt regrettable. They are inconsistent with democracy. They are unsocial. And they seem peculiarly unjust when they represent largely unearned increment. But the wealth of the Astors does not endanger political or industrial liberty. It is insignificant in amount as compared with the aggregate wealth of America, or even of New York City. It lacks significance largely because its owners have only the income from their own wealth. The Astor wealth is static. The wealth of the Morgan associates is dynamic. The power and the growth of power of our financial oligarchs comes from wielding the savings and quick capital of others. In two of the three great life insurance companies the influence of J. P. Morgan & Co. and their associates is exerted without any individual investment by them whatsoever. Even in the Equitable, where Mr. Morgan bought an actual majority of all the outstanding stock, his investment amounts to little more than one-half of one per cent. of the assets of the company. The fetters which bind the people are forged from the people's own gold. But the reservoir of other people's money, from which the investment bankers now draw their greatest power, is not the life insurance companies, but the banks and the trust companies. Bank deposits represent the really quick capital of the nation. They are the life blood of businesses. Their effective force is much greater than that of an equal amount of wealth permanently invested. The 34 banks and trust companies, which the Pujo Committee declared to be directly controlled by the Morgan associates, held $1,983,000,000 in deposits. Control of these institutions means the ability to lend a large part of these funds, directly and indirectly, to themselves; and what is often even more important, the power to prevent the funds being lent to any rival interests. These huge deposits can, in the discretion of those in control, be used to meet the temporary needs of their subject corporations. When bonds and stocks are issued to finance permanently these corporations, the bank deposits can, in large part, be loaned by the investment bankers in control to themselves and their associates; so that securities bought may be carried by them, until sold to investors. Or these bank deposits may be loaned to allied bankers, or jobbers in securities, or to speculators, to enable them to carry the bonds or stocks. Easy money tends to make securities rise in the market. Tight money nearly always makes them fall. The control by the leading investment bankers over the banks and trust companies is so great, that they can often determine, for a time, the market for money by lending or refusing to lend on the Stock Exchange. In this way, among others, they have power to affect the general trend of prices in bonds and stocks. Their power over a particular security is even greater. Its sale on the market may depend upon whether the security is favored or discriminated against when offered to the banks and trust companies, as collateral for loans. "The men who through their control over the funds of our railroads and industrial companies are able to direct where such funds shall be kept and thus to create these great reservoirs of the people's money, are the ones who are in position to tap those reservoirs for the ventures in which they are interested and to prevent their being tapped for purposes of which they do not approve. The latter is quite as important a factor as the former. It is the controlling consideration in its effect on competition in the railroad and industrial world." But the power of the investment banker over other people's money is often more direct and effective than that exerted through controlled banks and trust companies. J. P. Morgan & Co. achieve the supposedly impossible feat of having their cake and eating it too. They buy the bonds and stocks of controlled railroads and industrial concerns, and pay the purchase price; and still do not part with their money. This is accomplished by the simple device of becoming the bank of deposit of the controlled corporations, instead of having the company deposit in some merely controlled bank in whose operation others have at least some share. When J. P. Morgan & Co. buy an issue of securities the purchase money, instead of being paid over to the corporation, is retained by the banker for the corporation, to be drawn upon only as the funds are needed by the corporation. And as the securities are issued in large blocks, and the money raised is often not all spent until long thereafter, the aggregate of the balances remaining in the bankers' hands are huge. Thus J. P. Morgan & Co. (including their Philadelphia house, called Drexel & Co.) held on November 1, 1912, deposits aggregating $162,491,819.65. The operations of so comprehensive a system of concentration necessarily developed in the bankers overweening power. And the bankers' power grows by what it feeds on. Power begets wealth; and added wealth opens ever new opportunities for the acquisition of wealth and power. The operations of these bankers are so vast and numerous that even a very reasonable compensation for the service performed by the bankers, would, in the aggregate, produce for them incomes so large as to result in huge accumulations of capital. But the compensation taken by the bankers as commissions or profits is often far from reasonable. Occupying, as they so frequently do, the inconsistent position of being at the same time seller and buyer, the standard for so-called compensation actually applied, is not the "Rule of reason", but "All the traffic will bear." And this is true even where there is no sinister motive. The weakness of human nature prevents men from being good judges of their own deservings. "More than $150,000,000 of the stock of the Steel Corporation was issued directly or indirectly (through exchange) for mere promotion or underwriting services. In other words, nearly one-seventh of the total capital stock of the Steel Corporation appears to have been issued directly or indirectly to promoters' services." The so-called fees and commissions taken by the bankers and associates upon the organization of the trusts have been exceptionally large. But even after the trusts are successfully launched the exactions of the bankers are often extortionate. The syndicate which underwrote, in 1901, the Steel Corporation's preferred stock conversion plan, advanced only $20,000,000 in cash and received an underwriting commission of $6,800,000. The exaction of huge commissions is not confined to trust and other industrial concerns. The Interborough Railway is a most prosperous corporation. It earned last year nearly 21 per cent. on its capital stock, and secured from New York City, in connection with the subway extension, a very favorable contract. But when it financed its $170,000,000 bond issue it was agreed that J. P. Morgan & Co. should receive three per cent., that is, $5,100,000, for merely forming this syndicate. More recently, the New York, New Haven & Hartford Railroad agreed to pay J. P. Morgan & Co. a commission of $1,680,000; that is, 2 1/2 per cent., to form a syndicate to underwrite an issue at par of $67,000,000 20-year 6 per cent. convertible debentures. That means: The bankers bound themselves to take at 97 1/2 any of these six per cent. convertible bonds which stockholders might be unwilling to buy at 100. When the contract was made the New Haven's then outstanding six per cent. convertible bonds were selling at 114. And the new issue, as soon as announced, was in such demand that the public offered and was for months willing to buy at 106 bonds which the Company were to pay J. P. Morgan & Co. $1,680,000 to be willing to take at par. These large profits from promotions, underwritings and security purchases led to a revolutionary change in the conduct of our leading banking institutions. It was obvious that control by the investment bankers of the deposits in banks and trust companies was an essential element in their securing these huge profits. And the bank officers naturally asked, "Why then should not the banks and trust companies share in so profitable a field? Why should not they themselves become investment bankers too, with all the new functions incident to `Big Business'?" To do so would involve a departure from the legitimate sphere of the banking business, which is the making of temporary loans to business concerns. But the temptation was irresistible. The invasion of the investment banker into the banks' field of operation was followed by a counter invasion by the banks into the realm of the investment banker. Most prominent among the banks were the National City and the First National of New York. But theirs was not a hostile invasion. The contending forces met as allies, joined forces to control the business of the country, and to "divide the spoils." The alliance was cemented by voting trusts, by interlocking directorates and by joint ownerships. There resulted the fullest "cooperation"; and ever more railroads, public service corporations, and industrial concerns were brought into complete subjection.